When you have been around for over 500 years, you learn to take the long view. But how do you keep an eye on the future when technology moves so quickly? You have to plan ahead. That is what we are doing here at the Port of Rotterdam Authority. Rotterdam is Europe’s biggest and busiest port, stretching 42 kilometers from end to end. Every year, 130,000 vessels—including the world’s biggest cargo ships—sail in and out of our port. We process some 8 million containers and over 468 million tons of cargo. Ensuring the safe passage and berthing of these vessels, as well as the transfer of their cargo, takes a lot of effort. In some ways, we are a city within a city, and home to 3,000 businesses that employ over 180,000 people. The objective of the Port of Rotterdam Authority is to enhance the port’s competitive position as a logistics hub and world-class industrial complex. Not only in terms of size, but also quality. One of the biggest challenges we face is growth. We have no more physical room to expand, and our environmental footprint must decrease by up to 95% in 2050. Therefore, the only way we can increase capacity is to streamline our operations. This allows us to better serve the various entities that operate in the Port of Rotterdam, and the vessels that transit through it. No matter who you are, you are part of a bigger supply chain. It is the Port Authority’s responsibility to deliver safe, smooth, clean, and secure handling of shipping in the port area. We supervise and control traffic planning, traffic management, and safety inspections. The Port Authority also has the responsibility to develop, manage, and exploit the port in a sustainable way. We control the port area based on a landlord principle where we develop and rent out the land. The facilities and terminals are operated by private companies. Our job is to build and manage the port’s infrastructure so vessels can come through and our tenants can go about their business with good connections to the hinterland. We are part of a bigger supply chain and want to be a strong link. The logistics of maritime shipping necessitates coordination with our many partners on land and at sea. In the 21st Century, this requires data. To meet our present and future needs, we embarked on a digitization journey to become, as many say, 'the smartest' port in the world. For me, being a smart port means more than merely introducing awesome new technology into a port to make it safer, more efficient, and more sustainable. It is also about looking further ahead in time, making strategic choices to ensure that the port still exists in the future, whilst responding to changes in climate, politics, technology, industries, and cargo flows. 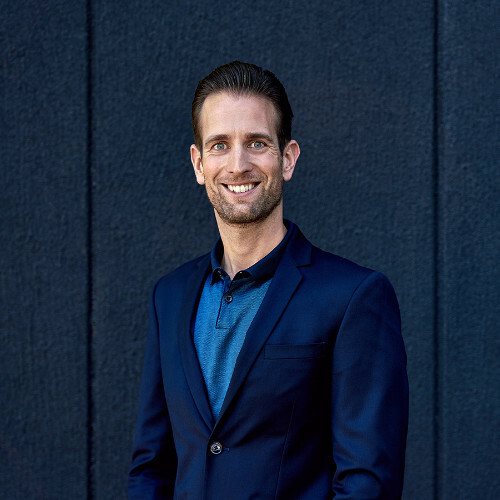 Due to these rapid changes and our physical and environmental space challenges, the complexity for the Port of Rotterdam Authority is increasing and data is needed to make the right decisions. We began our digitization journey by upgrading the tools we use to collect and process data from our port area, thus creating a stronger foundation for data-based decision-making. We wanted to consolidate the many existing applications with a single platform for sensor data like weather, water, environment, infrastructure, etc. This new solution requires a robust Internet of Things (IoT) ecosystem that is secure, reliable, and standardized. The first goal of our IoT platform is to digitize the many aspects of—and influences on—a vessel's journey in and out of the port, for improved traffic planning and management. With all that data in a single ecosystem, the development of decision support systems becomes much easier. To achieve this, and to collect the needed data, we had to connect the physical port to the digital world. We connected our network of sensors placed at strategic locations in the port to capture real-time data about water and weather conditions, including height of tide, tidal stream, salinity, visibility, wind speed, and direction. All this mission-critical data helps us plan and guide vessels into the port. It has to be accurate, up to date, and granular because we use it to predict upcoming conditions. We need to calculate all of this in advance, so we can set a time for a vessel to enter the port and give advice on needed port services like tugboats and mooring lines for a safe passage and berth. Optimizing route planning increases fuel efficiency, which saves money, reduces carbon emissions, and improves air quality. A good example of how vital the process can be is the planning of tidal windows for vessels with a deep draught. With a massive difference between high and low tide in the Port of Rotterdam, some larger vessels may only enter at high tide in order to keep a safe under keel clearance. Tidal windows in our port can be as small as 30 minutes per day. If we provide a vessel with the wrong planning or numbers and it subsequently runs aground, a simple sorry will not do, because with vessels up to 400 meters long and 70 meters wide carrying all kinds of cargo, the effects of that can be catastrophic. We use highly precise, robust, and off-the-shelf sensors to gather our water and weather data. They are, however, based on older technology standards from a time when the Internet of Things did not exist. Despite their precision, these sensors lacked some key features to use them in our IoT ecosystem. Features like remote device management, authorization, and encryption are needed for security and reliability. This is why we chose not to directly connect the sensors to the internet but have a secure router in between. It is also why the network layer of our data acquisition and analysis platform has to be rock solid. Security is crucial to the Internet of Things. Every device and sensor can potentially be hacked. When it comes to network security, Cisco is number one in the world. We did an RFP with a strong emphasis on security and IBM teaming up with Cisco came out on top. Cisco not only offers robust security features, but the company’s 809 and 829 industrial routers can also withstand the weather conditions and temperature variations at the Port of Rotterdam. Our Cisco routers also run edge applications that refine the data collected by our sensors before it is integrated into our central system. These programs are quite sophisticated and would have required dedicated internal servers some years ago, but now they run on the routers themselves. This is not only efficient, but also cost effective. Cisco’s Kinetic IoT platform sits atop this network of routers and allows us to be in full control of the connected devices and data streams. Kinetic is a centralized gateway that allows us to manage the sensors, routers, and data streams to and from our IBM IoT platform. It automatically connects our routers to the right upstream environment. We do not have to set up and secure these routers in the field because they come pre-configured from the factory. It may seem like we are giving up control by using pre-authorized equipment, but it is just the opposite. If a router is not pre-configured and authorized by Cisco specifically for use in our IoT ecosystem, you can not even connect it. This is a huge plus when dealing with a setup like ours that has devices scattered across a 126 square kilometer area. Another benefit is the fact that Kinetic is a managed service. We plug the 809 and 829 routers into our network and leave the rest to Cisco and other great partners like Axians. We do not have to worry ourselves about the latest patches, upgrades, and functionalities anymore. With IoT security fully in control, we are free to concentrate on the actual smart applications running on top. It gives us the peace of mind to think about the future, innovate, and make a difference. Cisco Services worked closely with us to craft the solution and integrate it with our ecosystem. We are the first organization to implement Cisco Kinetic in a mission-critical industrial application and a lot of what we specified made it into the product they are now offering as a global solution. I like to think that there is a bit of the Port of Rotterdam in the platform that other Kinetic customers are using now. You could say the high tide raises all ships. Speaking of ships, we are on the cusp of a revolution in maritime transport. I am talking about more environmentally friendly and autonomous vessels. It is no secret that heavy industries are going green. And maritime transport is no exception. The agenda of the International Maritime Organization is filled with initiatives to make ships and ports more environmentally friendly, including the adoption of autonomous vessels in the near future. These vessels have already passed the prototype phase and you will hear more and more about them in the coming years. And this evolution goes hand in hand with innovation in technology that reduces fuel consumption, for example using the wind and the sun to capture energy for sailing. For me, it is clear that autonomous vessels will be more environmentally friendly and contribute to our target of reducing emissions in the Rotterdam Port area. It is a natural continuation of advanced robotics and autonomy that spreads over many industries, from agriculture, warehouses, container terminals, and even public transport. The common motivator is always improved safety and efficiency in its application. We have numerous examples in the Rotterdam Port area where businesses have really embraced autonomy and add sustainable value by doing that. At the Port of Rotterdam Authority, we will be ready to berth autonomous vessels before the year 2030. This means that all the objects, traffic, conditions, policies, and transactions that affect a vessel’s safe berth and passage will be fully digitized in a digital twin and communicating with their environment in a spatiotemporal context. Cisco is an important piece of this bigger picture. Kinetic has helped us to set up a standardized plug-and-play IoT ecosystem. We will not have to build a whole new infrastructure again. We can simply add and replace sensors and routers as better equipment becomes available, new technologies emerge, and new needs arise. While always piggybacking on the highest security standards. In the end, running a port is a lot like steering a ship. You have to see what is ahead and then plan for it. If there is a storm in your path, you need to know in advance, so you have enough time to choose another route. Smooth seas and sunny skies today do not mean full speed ahead tomorrow. To get a grip on disruption, think 10, 20, 50, or even 100 years ahead. Positioning Rotterdam as the world’s smartest port means staying on top of emerging technologies. Advanced robotics, artificial intelligence, blockchain transactions, and hyper-precise data are already disrupting the way we do business today, but we also have to look ahead 10, 20, 50, or even 100 years. We need to take into account many scenarios on what the world will look like decades into the future, and understand what our customers and the planet itself will require. 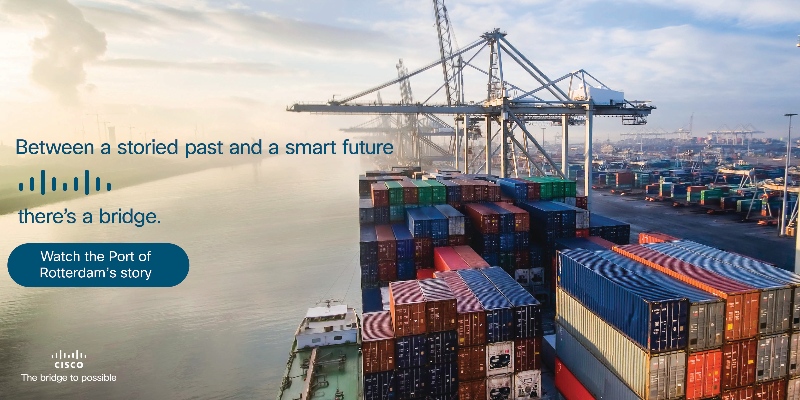 Cisco is helping the Port of Rotterdam navigate into the future. We are doing everything we can to prepare for the challenges and the growth ahead, but with so much change on the horizon, we are sailing into uncharted waters. This is a very exciting time for us. There are great opportunities for IT applications to improve Port of Rotterdam's social and economic value. I try to accelerate the use of smart solutions in the port area, which is a beautiful but harsh environment for new technology. More Stories from Cisco U.S.